Pintoy has been extensively tested as a means to improve tropical pastures through inter-seeding with grass. When properly managed, Pintoy can increase the value and sustainability of tropical pastures. As a legume, Pintoy can improve soil nitrogen levels therefore improving the growth of pasture grass. 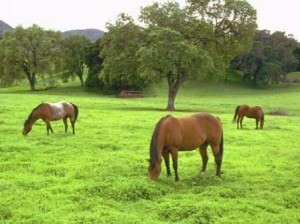 Its high forage value increases the health and weight gain of pastured animals and it makes an especially excellent forage for horses. Alfalfa (Lucern), also a legume, is known throughout the world as the leading forage species for horses and farm animals due to its high nutritional quality, digestibility and palatability. The perennial peanut actually has an animal feeding quality equivalent to alfalfa. Today, approximately 30-40,000 acres are planted in Florida for hay production. Pintoy Seeds is testing and developing new varieties with improved characteristics and performance. The company is testing a new taller variety that is expected to provide excellent hay yields. We hope to launch this new variety in the foreseeable future.